About | Tech for Lunch! 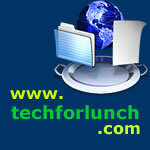 Welcome to the “Technology for Lunch” Blog! The goal is very simple.. to cover anything that has to do with technology and that might be of interest to You, the readers. If you crave technology, work with it or if you are an enthusiast, you have come to the right place to get your fix. Please subscribe to the RSS Feeds and participate by posting your comments and sending suggestions for future articles. After all, a blog becomes so much more interesting when readers give their opinion and debate on all the different subjects that are discussed. My intent is to post at least once a day and I will follow the news and interests of the readers as well.